The Priory continues to be used as a home by its owners and we hope, though closed at the present time, it will soon be open once again to members of the public, following a recent change of ownership. The parentage of St Osyth varies according to different historical writings. 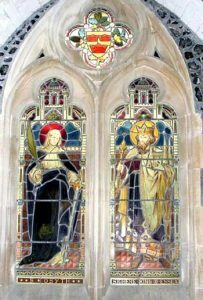 According to Historic England, Osyth was the daughter of Frithwald, King of Mercia and wife to Sighere, the first Christian King of Essex and is purported to have been brutally martyred at the hands of Danish marauders in 653 AD. The Priory was built in her honour. The settlement now known as St Osyth is recorded as Chicc in the Domesday Book of 1086, and is said to be the location of a C7 convent founded by Acca, Bishop of Dunwich. St Osyth is an area which has become a favourite place for holidaymakers, the majority of whom use static caravan and chalet facilities, either as owners or visitors in such numbers as to raise the population in the Summer Season to over 20,000. To the west of the village centre is Mill Street which leads to our small harbour, used by seafarers for mooring and boat repairs. To the western end of St Osyth Beach is an area set aside for naturists. ST OSYTH parish is on a creek of the Colne, opposite Brightlingsea, 4 miles south from Thorrington and 4 from Great Bentley stations on the Tendring Hundred branch of the London and North Eastern railway, 4 west from Clacton-on-Sea, 12 south-east from Colchester and 12 south-west from Walton steamboat pier, in the Harwich division of the county, Tendring hundred, petty sessional division and rural district, Colchester, Clacton and Halstead joint county court district, rural deanery of St Osyth, archdeaconry of Colchester and diocese of Chelmsford; some parts of this parish, which is very extensive, are high, including Beacon Hill, but a great portion is marsh land. The church of SS. Peter and Paul and St Osyth is a large and ancient structure, originally built of rubble and flints, in the same manner as the priory buildings adjoining, mainly in the Late Perpendicular style, with portions of Early English and perhaps of the Norman styles: it consists of chancel, nave of four bays, aisles with south chapel, north and south porches and a massive embattled tower at the west end, containing 6 bells: on each side of the chancel are the monumental recumbent effigies in marble of the first and second Lords Darcy, and their wives, with inscriptions, and with armorial bearings: in the chapel of the south aisle is a mural tablet to Briant Darcie, high sheriff of the county, ob. 25th Dec. 1587, and Bridget his wife, with other members of his family: in the same chapel is the recumbent effigy of John Darcy, serjeant-at -law, in his robes, ob. 15th March, 1638: on the south side of the chancel are mural tablets to the Right Honourable William Henry (Nassau), 4th Earl of Rochford K.G. ambassador and secretary to George III. who died 20th Sept. 1781, and to Lucy (Young), his wife, d. 9 Jan. 1773: there is a modern tablet in the north aisle to Benjamin Golding M.D. founder of Charing Cross Hospital, who died in 1863 a stained window was erected in 1911 in memory of the Rev. G. A. Webster, vicar 1897-1910: a new organ was erected in 1907, at a cost of £400: there are two Gothic screens, designed by Sir H. Blomfield R.A. which were bought by the parochial church council from Whitelands Training College, on its removal to Putney hill: one divides the St. Cleres chapel from the south aisle and the other forms a protection to the belfry: there are 400 sittings. The register dates from the year 1666. The living is now a vicarage, net yearly value £460, with residence, in the gift of the Bishop of Chelmsford, and held since 1922 by the Rev. John Henry Mitchell M.A. of St. John’s College, Cambridge. Here is a Methodist chapel with 274 sittings. The mission church at St Osyth Heath, erected in 1898, at a cost of £155, is a wooden building and affords sittings for 60 persons. A cemetery of 2 acres was formed in 1855, at a cost of £1,000, and has two mortuary chapels; it is under the control of the Parish Council acting as a burial board. The Johnson Institute erected in 1911 by Mrs. Cowles in memory of the late Sir John Johnson, contains reading room and billiard rooms, and a boys’ room fitted with gymnastic apparatus. There are four almshouses, restored by public subscription in 1897, in commemoration of the Diamond Jubilee of her late Majesty Queen Victoria. The charities include the Town Field, near Weeley, now let for £5 (less 24s. annual tithe), and Banyard’s charity, a first charge of £2 10s. on a field at present attached to Braziers Farm. These sums are distributed at Christmas to the poor in food and clothing and money for the support of the almshouses. 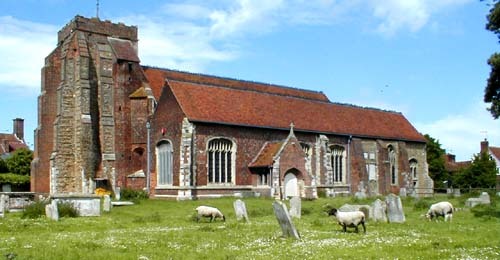 This is one of the oldest places in the county and was originally part of the Royal demesne of King Canute, who granted it to Earl Godwin, and by him it was given to Christ Church, Canterbury, and at the Conquest was transferred to the Bishops of London; it was formerly called “”Chich,” but takes its present name from St Osyth, daughter of Frithwald, a Mercian prince, who built a nunnery here, of which she was first abbess and where in 653 she was martyred by heathen pirates. On the site of the nunnery, probably destroyed by these invaders, Richard de Belmeis of London, in the reign of Henry I. founded a priory for canons of St. Augustine, and his remains were buried in the chancel of the church in 1127: he bequeathed the church and tithes to the canons, who elected as their first abbot or prior William de Corbeuil, afterwards Archbishop of Canterbury, who died in 1136, bequeathing large benefactions to this house, to which valuable charters were granted by Henry II. and in Abbot Vyntoner’s time it was largely rebuilt, the gate way, abbot’s tower and other portions now remaining being erected in that period: at the Dissolution its revenues were valued at £758 5s. 8d. yearly: it is now, in its modernized form, the residence of Brig.-Gen. Kenneth John Kincaid-Smith CB., C.M.G., D.S.0., D.L., J.P. and is entered through a gate house of Late Perpendicular date, elaborately covered with panelled work in flint and stone and consisting of an arched entrance with flanking towers: the whole is embattled and is supposed to have been erected about the reign of Henry VII. : in the quadrangle is a range of old buildings in the Tudor style, with an octagonal observatory; there is also a lofty clock tower of modern date and two smaller ones; in the front of the mansion is a fine 16th century oriole window, in the wall of what was part of the abbot’s lodgings, on which the initials of John Vyntoner, the last abbot but one, are frequently repeated, along with in every case a bunch of grapes. a tun of wine and his initials J. V. end the date 1527: the park of 350 acres is well studded with trees, and at the east end of the house are extensive vineries, a conservatory and peach house. St. Cleres hall, the residence of H. L. Thornhill esq. one mile south-east from the vi1lage, presents a very ancient appearance: it was once wholly and is still on three sides surrounded by a moat and was the residence of the Dean family for over 200 years; the last representative died in 1888. On the coast are three Martello towers. Cowley Park, a recreation ground of 7 acres, situated in the centre of the village, was presented in 1920 by Mrs. M. B. Cowley, former owner of the Priory: a pavilion was erected in 1927: at the entrance to the ground is a war memorial, which contains the names of 57 men who fell in the Great War, 1914-18. The manor is vested in trustees. The principal landowners are Brig.-Gen. Kenneth John Kincaid-Smith C.B., C.M.G., D.S.0., D.L., J.P. the Earl of Onslow P.C., 0.B.E., D.L., J.P. Messrs. Edward and Harold Hutley, Leonard G. Dale, Thomas Rowland, Joseph Smith (Farms) Limited and Alfred Dale. The soil is good mixed; subsoil, gravelly and sand. The chief crops are wheat, barley and oats. The area is 8,956 acres of land, 37 of inland and 22 of tidal water and 854 of foreshore; there is a fine stretch of sand on the beach, some four miles in extent, and the place is rapidly becoming a popular holiday resort; the population in 1931 was 1,463 in the civil and of the ecclesiastical parish in 1921, 1,283. BLOCK HOUSE WICK is situated on the coast at the mouth of the river Colne. LEE WICK, is another farm divided by a creek from St Osyth beach. WIGBOROUGH WICK, is a mile and a half southeast.